Before you can project from computers on your network, you must select the network settings for the projector using its menu system. Note: Make sure you already connected the projector to your wired network using the LAN port. Select the Basic menu and press Enter ( ). Projector Name lets you enter a name up to 16 alphanumeric characters long to identify the projector over the network. 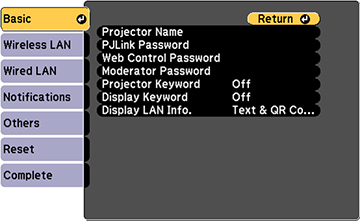 PJLink Password lets you enter a password up to 32 alphanumeric characters long for using the PJLink protocol for projector control. Projector Keyword lets you turn on a security password to prevent access to the projector by anyone not in the room with it. You must enter a displayed, randomized keyword from a computer using the Epson iProjection (Windows/Mac) software to access the projector. Display Keyword lets you select whether or not to display a projector keyword on the projected image when using the Epson iProjection (Windows/Mac) software to access the projector. Display LAN Info lets you select how the projector displays network information. You can select an option to display a QR code that lets you quickly connect your iOS or Android devices using the Epson iProjection app. Note: Use the displayed keyboard to enter the name, passwords, and keyword. Press the arrow buttons on the remote control to highlight characters and press Enter ( ) to select them. 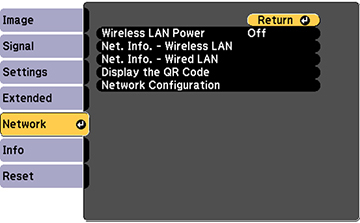 Select the Wired LAN menu and press Enter ( ). If necessary, select IP Settings and press Enter ( ). If your network assigns addresses automatically, turn on the DHCP setting. If you must set addresses manually, turn off DHCP and enter the projector's IP Address, Subnet Mask, and Gateway Address as needed. Note: To highlight the numbers you want from the displayed keyboard, press the arrow buttons on the remote control. To select a highlighted number, press Enter ( ). To prevent display of the IP address on the standby screen, turn off IP Address Display. 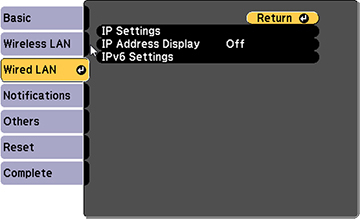 To connect the projector to the network using IPv6, select On as the IPv6 Settings option. Then select the Auto Configuration and Use Temporary Address settings as necessary. When you finish selecting settings, select Complete and follow the on-screen instructions to save your settings and exit the menus.